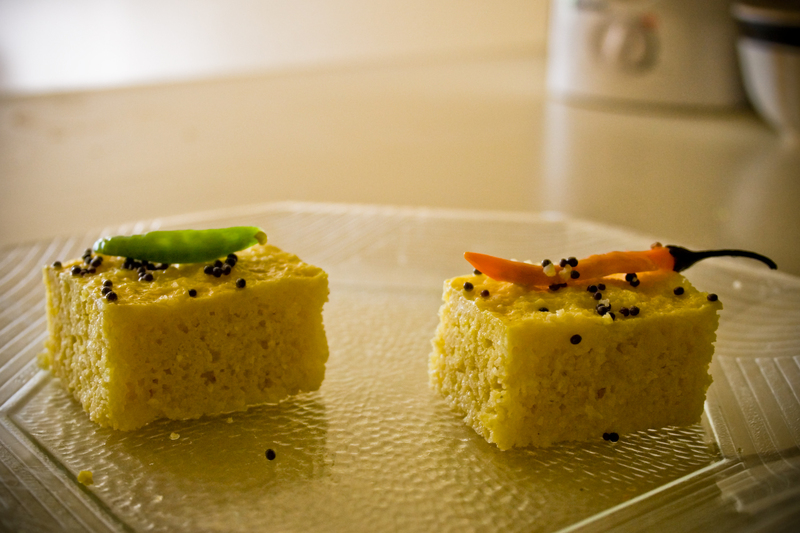 Before even starting the whole process, I had thought that I would be writing a post about How ‘not’ to make dhokla, but it turns out that making okayish dhokla is not that technical after all. Messing up in all the ways I could possible can, they still turned out to be ‘dhokla’. I tried to stick to the instructions given to me first by my bhua, then again by my chachi and mom, but me being me ended up doing some things just based on gut feeling than going by the book. Here is a short description of the whole process, the way I did it, tried and tested. Caution: The only flaw in this version was that they were not soft enough, which I think is the key between an okay dhokla and quality dhokla. I believe it has to do with the ingredients than with the process itself, so if you are the experimenting kinds, you can try adding more eno while steaming them, or a more finely ground rice flour). Mix rice flour OR rice rava OR sooji with equal proportions of besan (chick peas flour). I mixed about 100 gms of each, and that was enough to make dhoklas for about 10 people. Mix curd and some water, till its pasty, something like toothpaste pasty. Again I did not have normal curd so used goat milk curd instead. I also kept it outside overnight to sour it. Keep the paste in open for few (3-4) hours. When you are ready to make it, add salt, chilies, pepper, two spoon oil, ginger (better every thing mixed and blended) to taste. Now to cook it, I used a steel pan ( I actually used this ) to serve as the container, and put it inside a pressure cooker or rice cooker, on a steel stand. If you use cooker dont use the whistle. ( I infact used rice cooker with blocked vent, as the steam can easily escape thru the sides ). Add some eno (half a spoon per pan) or baking soda and mix it. Let it steam for 20-25 mins and you are done with the core of the dhokla. To add garneshing, saute some mustard seeds and whole green chilies in ghee, add water and pour it over the dhokla. Ymmy dhoklas are ready to be served. I should be too excited to write this post about Catalina Island as it was my first ever experience on an Island, but somehow the excitement it gone, in part because of my procrastination and in part I had high hopes of what I would be experiencing at an Island. The photos are up at my photoblog here but this time I had uploaded it using the exif data so all the photos are now in the past and does not appear on the front page. I apologize for this. Hope you would still enjoy the images. Regarding the trip, as I said the feeling has worn off as this was three months back, but I remember some things which I would like to still write about. The first thing still clear is the boat ride from the mainland to the Island, which was the best part of the whole journey. Other thing which made our trip was the small little things that was pain inflicted by people and god which actually made our trip a memorable one. Things like paying $77 extra as we were eight people instead of seven and the van could legally take only seven, like loosing our way to the campsite and enjoying the night hike, like waiting for the bus for over an hour on our way back, like running half a mile for the shower after a dip in the sea, and knowing that its a paid shower and we did not get money and many other amusing things.